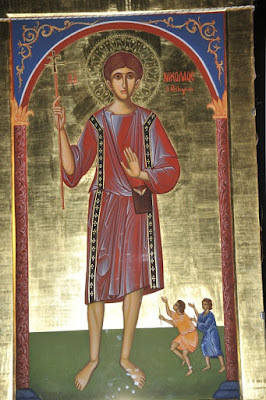 Saint Nicholas the Pilgrim was born in Steiri of Boeotia in Greece in the year 1075. His parents were poor farmers that did not give him an education. When he was eight years old his mother sent him to become a shepherd. He did not last long as a shepherd however, because one day he suddenly called out "Kyrie Eleison", which he then began to say repetitively. His constant repetition of this phrase brought him conflict and aggression in populated places, and he suffered much oppression. Even his mother punished him for this. In Orthodox tradition, this is why he is regarded as a Fool for Christ. When he was twelve years old, in 1087, his mother kicked him out of the house and told him to never return. He therefore decided to go up Mount Helicon where he found a cave to dwell in. In the cave he encountered a bear that dwelled there, but he took up his cross and said to the bear: "I order you in the name of Jesus Christ to never again enter this place." The bear then left and never returned, while Nicholas lived there and survived off plants. Not long after this he met a certain monk who came to him calling him by name and who taught him some basic things about the monastic life. Thinking that her son was demon possessed, the mother paid some men to go out and find her son. When they found him they took him to the Monastery of Hosios Loukas in Boeotia in 1088. There the monks tried to exorcise him of any demons, but Nicholas kept repeating "Kyrie Eleison". Unable to do anything, they let him go free. Returning to his mother's house, he picked up an ax, a saw and a knife and climbed the mountain where he made crosses from tree trunks, placing them at crossroads and inaccessible places. He tried to persuade his brother George to follow the same path as he did, but he did not. For a few years this is how Nicholas spent his life, and wherever he went everyone thought he was crazy. Then by divine revelation he went on a pilgrimage to Rome. In 1092 he arrived in Nafpaktos where he met a monk named Bartholomew, who accompanied him on his journey to Italy. In Otranto he performed a miracle helping a ship arrive at harbor that for many days stayed out due to the strong winds. He passed through many parts of Italy, preaching the word of the Lord, chanting "Kyrie Eleison" and performing wonders. When he arrived in the city of Taranto crying "Kyrie Eleison" and "Repent", the Bishop of the city was angry and made people to beat him cruelly. Leaving from there, he arrived in the city of Trani half-dead and carrying a cross while chanting "Kyrie Eleison", and the bishop welcomed him there. Before he died there he miraculously changed water into sweet wine. He reposed on June 2, 1094. Saint Nicholas was canonized in the year 1099 by Pope Urban II. His biography was compiled in 1140 by an anonymous writer in Trani on the basis of what was told to him by Bartholomew the monk who accompanied him from Nafpaktos. In 1142 his relic was placed in a chapel of the Cathedral of Trani. He is venerated particularly in Trani. Today Trani Cathedral is dedicated to him, and he is the patron saint of the city. His feast day is June 2nd in both the Orthodox and Catholic Churches, and is one of the rare post-schism saints honored by both East and West, though he is not officially recognized in the East. The annual procession through Trani in his honor is held in the last week of July. In 2010 the Municipal Council of the city of Steiri named the central square "Plateia Agiou Nikolaou Proskyniti Steririoti" or PIAZZA SAN NICOLA IL PELLEGRINO DI TRANI or Saint Nicholas the Pilgrim Square in Steiri.